It should be said before you begin a local SEO campaign, successful local SEO can be HARD. As with all good things in life, your success is not going to come easy — regardless of what others might say. Ultimately you may find that you’re not as successful as you want to be, simply because there are factors outside of your control that influence your rankings. As an SEO or small business owner you never want to hear this but it’s Google’s world. We just search in it. Here are just a few that you should be aware of. 1) One of the biggest hurdles to proper SEO is time. Local SEO is time consuming. If you think that there’s a simple, magic sauce that you can learn and dish out in an afternoon that will solve all your problems you can probably stop reading now. Successful local SEO takes time and knowledge. If I had to pick one of the two I would wholeheartedly say that success depends on the amount of time that you can devote to this work ongoing. If you don’t have time now, consider enlisting a professional or at least trying to bribe a friend that has the required time and knowledge. Claiming and optimizing your local listings does not guarantee success. It’s a great first step but ultimately just one of many. 2) Geo-location plays a big part in the way businesses rank in local listings. If you’re a business that’s in the outskirts of a large city and you have competitors downtown, you have an immediate hurdle that you may never overcome. We call this proximity to centroid and it’s a major ranking factor. 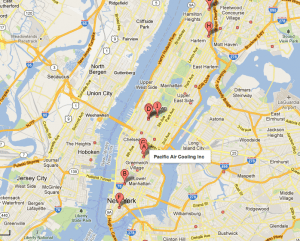 As you can see from the map below, it’s going to be hard to show up for searches in New York City if you’re a heating and cooling contractor just outside of the city. 3) Many businesses have their priority keywords in their business name. If you don’t have keywords in your company name then you have another hurdle that can be difficult to overcome. You can’t change your official business name on listings just to include keywords. 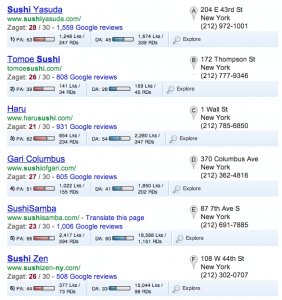 I’m not saying that this is the only factor but as you can see from the screenshot below, almost all of the businesses within the results for “New York Sushi” all have the word sushi in their name and/or at least their domain name. Reviews, links, ratings, user generated content, discussions about your products and services, etc. can all figure into your rankings. All you can do is find ways to encourage these factors. Never try to artificially manipulate or fake them. 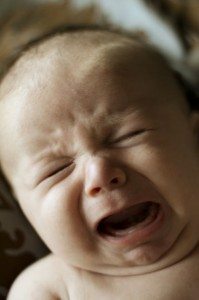 More advice on reviews here. 5) You’ll likely need a multi-prong attack. Plan to attack the problem from multiple angles. Since there are many factors — and ultimately many that are outside of your controll — you should have a multi-prong attack plan. Again this goes into having the necessary time, knowledge and skills needed to get the job done right. More advice on ranking factors here. 6) Things don’t make sense. You should know that when you’re trying to rank within the search engines, sometimes things just don’t make sense on the surface. There are potentially hundreds of things that can influence why one company is ranking and ultimately why you’re not. Starting your work with this understanding will help your sanity going forward. And… there’s one more from Linda over at the Catalyst Forums! Please feel free to add your comments below.